Have you or a loved one been diagnosed with osteoarthritis or rheumatoid arthritis, and you are wondering what this means? 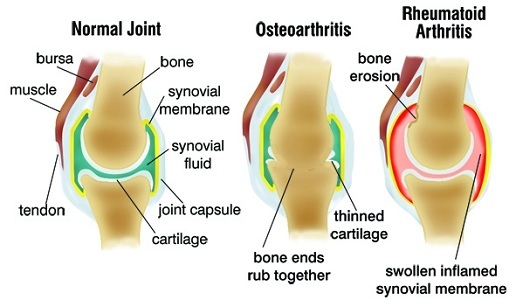 Osteoarthritis (OA) and rheumatoid arthritis (RA) are the two most prevalent types of the joint damaging condition. Osteoarthritis, the more common, is a result of wear and tear of the cartilage covering the ends of joint bones. Rheumatoid arthritis results from an immune system's defective attack of the lining within joints. This leads to swelling and pain and can ultimately lead to deformity of the joints. Bones within a joint are covered in cartilage which prevents the bones from touching each other. Osteoarthritis occurs when this cartilage breaks down and joint bones touch, causing excruciating pain. Osteoarthritis is also known as wear and tear arthritis. It starts within one joint. Rheumatoid arthritis is an autoimmune condition of chronic inflammation within joints. It occurs when the autoimmune system attacks joint lining tissue known as synovium. It affects many joints, and can also affect other body tissues and organs. Although researchers have conducted many studies, the cause of rheumatoid arthritis remains unknown. It is, however, known that the condition has a genetic predisposition. There are similarities and differences in symptoms of osteoarthritis vs. rheumatoid arthritis. There are similarities in diagnosing the two conditions. An X-ray of an affected joint shows the damage of either condition. Other diagnosing procedures include removal of joint fluid or arthrocentesis, and joint fluid analysis. Results of these tests help to differentiate between osteoarthritis vs. rheumatoid arthritis. Osteoarthritis vs. rheumatoid arthritis treatments have both similarities and differences. Other osteoarthritis treatment options include physical therapy to stabilize and strengthen affected joints, heat treatment, support/bracing, rest, and reduction of body weight. In addition, alternative treatment methods such as acupuncture and massage are used. Osteoarthritis vs. rheumatoid arthritis, which one is more prevalent? Studies show that in the U.S. alone, 27 million people suffer from osteoarthritis. The condition occurs more in people above the age of 65. Studies by the American College of Rheumatology show that about 70 percent of the population above 70 years of age has X-ray confirmation of osteoarthritis. Rheumatoid arthritis affects about 1.5 million people in the U.S. and up to 2 percent of the global population. It affects more women than men, with females accounting for 75 percent of rheumatoid arthritis patients. It affects people of all ages. However, it is more common in those aged between 30-60. In men, rheumatoid arthritis is more common in later life. What Is Rheumatoid Arthritis Remission?